Tory MEPs were not endorsing Hungary’s PM Viktor Orban by opposing EU measures to censure the nation, Environment Secretary Michael Gove has said. Two thirds of the European Parliament backed a motion against Mr Orban’s government, which is accused of attacks on minorities and the rule of law. Mr Gove told the BBC a “long-standing principle” was not to interfere in internal politics of other states. He refused to condemn the right wing politician directly. The European Parliament has voted to pursue unprecedented disciplinary action against Hungary over alleged breaches of the EU’s core values, which it denies. After Wednesday’s vote, the Board of Deputies of British Jews said it was disappointed Conservative MEPs had voted in “defence” of Hungary, while the Muslim Council of Britain questioned whether the Tories were seeking backing for its position on Brexit in return. Shadow chancellor John McDonnell was among the Labour MPs to criticise the vote, urging Theresa May to “call out” her MEPs. Conservative peer Lord Finklestein described it as “a really distressing thing to happen and shameful”. However, the Tory MEPs stressed they were not backing Mr Orban. 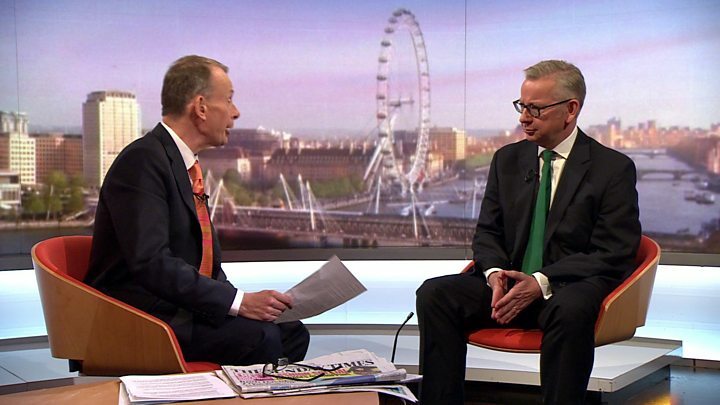 Mr Gove told BBC One’s Andrew Marr Show: “It is not for me to rank a league table of EU leaders. Since coming to power, his government has taken a hardline stance against immigration. It introduced a law which made it a criminal offence for lawyers and activists to help asylum seekers, under the banner of “facilitating illegal immigration”. But there have also been reports of pressure being put on the courts and the electoral system and widespread corruption.